Coat black (often with white on chest), brown or blond; slight shoulder hump, but highest point of body above hips; muzzle straight and long in profile; claws of front feet dark, strongly curved, and shorter (seldom more than 1 1/2 inches) than those of Grizzly Bear; males weigh 180-250 lbs., occasionally up to 400 lbs. ; females weigh 120-180 lbs. Largly nocturnal; usually solitary; dig less elaborate dens than Grizzly Bears, often in natural cavities (trees, rocks), under logs, brush piles, or even buildings; climb trees easily (MTFWP 1992). Pelage color varies, usually black in the eastern U.S., black, brown, cinnamon, blue-black, or whitish in western North America; snout brown, straight in profile; small rounded ears; five toes on both front and rear feet; head and body length 150-180 cm, tail about 12 cm, mass about 90-140 kg for females, 115-270 kg for males (Burt and Grossenheider 1964, and Nowak 1991). Differs from the Grizzly Bear in having the claws of the forefeet only a little longer than those on the hind feet (about twice as long in the Grizzly Bear), length of second upper molar less than 29.5 mm (in part of range where Grizzly Bear occurs), snout profile straight rather than dished, and in lacking a prominent hump at the shoulders; maximum size of Black Bear is less than that of the Grizzly Bear (170-280 cm head and body length) (Hall 1981 and Nowak 1991). Non-migratory, but Black Bears sometimes exhibit long distance movements. Dense forests; riparian areas; open slopes or avalanche chutes during spring green-up (MTFWP 1992). Habitat use tied to seasonal food availability/plant phenology. Dry mountain meadows in early spring; snow slides, stream bottoms, wet meadows in early and mid-summer. May concentrate in berry and whitebark pine areas in fall (Tisch 1961, Barnes and Bray 1967, and Jonkel and Cowan 1971). Grasses, sedges, berries, fruits, inner bark of trees, insects, honey, eggs, carrion, rodents, occassional ungulates (especially young and domestic), and (where available) garbage (MTFWP 1992). Diet varies: Spring - primarily vegetation (grasses, umbels, and horsetails); summer - herbaceous and fruits; fall - berries, nuts, and some vegetation. Insects a frequent component of diet. Also mammals, birds, and carrion (usually minor) (Tisch 1961). Sympatric with Grizzly Bear but more prone to occupying closed canopy areas. Natural cub and adult mortality low, sub-adult mortality higher (Jonkel and Cowan 1971). Black Bears sometimes involved in various crop/property depredations. Similar to Grizzly Bear, except females often first breed at 2 1/2 or 3 1/2 years of age; in very poor habitat, may not breed until 6 1/2 (MTFWP 1992). Estrus May 25 to August 10; peak in June. In NW MT first estrus at 4.5 years, often no litter until 6.5 years old. Average litter size 1.5 to 1.8 young/female. Litters every 2 to 3 years. Reproductive rates may be tied to softmast availability (Jonkel and Cowan 1971). Barnes, V.G. and O.E. Bray. 1967. Population characteristics and activities of black bears in Yellowstone National Park. Co. Coop. Wildl. Research Unit, Ft. Collins, CO. 199 pp. Burt, W.H. and R.P. Grossenheider. 1964. A field guide to the mammals. Houghton Mifflin Co.
Jonkel, C.J. and I.T. McCowan. 1971. The black bear in the spruce-fir forest. Wildl. Monogr. 27 :1-57. Montana Dept. of Fish, Wildlife and Parks. 1947-1992. Annual black bear hunting and harvest statistics. Helena. Nowak, R.M. 1991. Walker's mammals of the world. Fifth edition. Volumes I and II. Johns Hopkins University Press, Baltimore. 1629 pp. Tisch, E.L. 1961. Seasonal food habits of the black bear in the Whitefish Range of northwestern Montana. M.S. thesis. University of Montana, Missoula. 108 pp. Allen, R. B. 1985. Research and management implications of the pursuit of black bears with trained bear dogs. M.S. thesis. Univ. of Montana, Missoula. 51 pp. Andersen, K. W., and J. K. Jones, Jr. 1971. Mammals of northwestern South Dakota. Univ. Kan Mus. Nat. Hist. Pub. 19:361-393. Anonymous. 1956. Black bear boudoir. Montana Wildlife 6(1):25. Clark, J. D. and K. G. Smith, editors. 1991. Proceedings of the eastern workshop on black bear research and management. Univ. Arkansas. 150 pp. Flath, Dennis and David Dickson. 1994 Systematic wildlife observations on the Blackfoot-Clearwater Wildlife Management Area 1991-1993. Montana Department of Fish, Wildlife and Parks. Greer, S.Q. 1987. Home range, habitat use, and food habits of black bears in south-central Montana. Thesis. Bozeman, Montana: Montana State University. 91 p.
Haroldson, M. 1988. Home ranges, movements & spatial relationships of black bears in west central Colorado. M.S. thesis, University of Montana, Missoula. Horner, M. A. and R. A. Powell. 1990. Internal structure of home ranges of black bears and analyses of home-range overlap. J. Mammal. 71:402-410. Jonkel, C. 1965. Black bear population studies. State of MT, Proj. No. W-98-R-4. Jonkel, C. J. 1961. Tips on hunting black bear. Montana Wildlife. July. Jonkel, C. J. 1964. Estimating whole weights of black bears from hog-dressed weights. J. WildI. Manage. 28:581. Jonkel, C. J. 1967. Black bear population studies - big game research. Montana Dept. of Fish and Game. Job CompI. Rep., Fed. Aid Proj. No. W-98-R-l,2,3,4,5,6, Job No. B-1. 148 pp. Jonkel, C.J. 1967. The ecology, population dynamics, and management of the black bear in the spruce-fir forest of northwestern Montana. Ph.D. Thesis, University of British Columbia, Vancouver. 170 pp. Joslin, Gayle. 1980. Wildlife inventory and hard rock mining impact analysis of the West Cabinet Mountains and Lake Creek Valley, Lincoln County, Montana. MTFWP 91 pgs + 47 pgs app. Kasworm, W. F., and T. J. Thier. 1991. Black bear survival rates in northwest Montana. In K. Aune, comp., Proc. Mont. Chapt., The WildI. Soc., Bozeman. Kolenosky, G.B. and S.M. Strathearn. 1987. Black bear. Pages 442-454 in M. Novak, J.A. Baker, M.E. Obbard, and B. Malloch, eds. Wild Furbearer Management and Conservation in North America. Ontario Trappers Assn. and Ontario Ministry Nat. Res., Toronto, Ontario. Lariviere, S.. 2001. 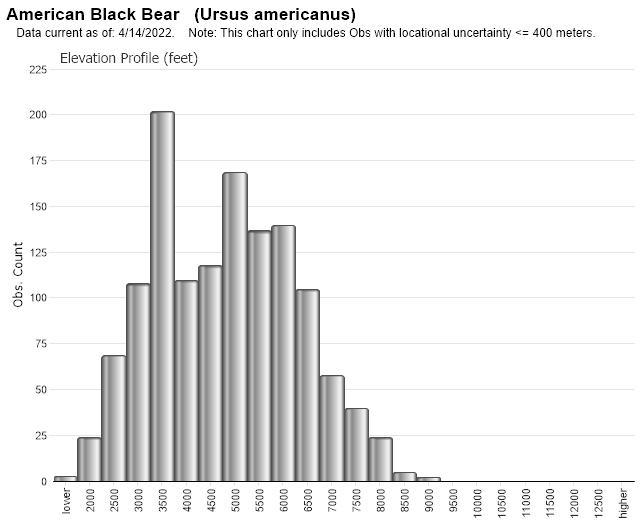 Ursus americanus. American Society of Mammalogists, Lawrence, KS. Mammalian Species No. 647:1-11. Mack, J. A. 1988. Ecology of black bears on the Beartooth Face, south-central Montana. M. S. Thesis. Montana State University, Bozeman. pp 119. Mack, J. A. 1990. Black bear dens in the Beartooth Face, south-central Montana. Int. Conf. Bear Res. and Manage. 8:273-277. McArthur, K. L. 1978. Homing behavior of tranplanted black bears, Glacier National Park. UnpubI. Prog. Rep., USDI National Park Service, Glacier National Park. 21 pp. McArthur, K. L. 1981. Factors contributing to effectiveness of black bear transplants. J. WildI. Manage. 45:102-110. Mussehl, T.W. and F.W. Howell (eds.). 1971. Game management in Montana. Montana Department of Fish, Wildlife and Parks, Helena, Mont. 238 pp. Stoneberg, R. P. and C. J. Jonkel. 1966. Age determination of black bears by cementum layers. J. Wild. Mgmt. 30(2):411-414. Swensen, J.E., W.F. Kasworm, S.T. Stewart, C.A. Simmons, and K. Aune. 1987. Inter-population applicability of equations to predict live weight in black bears. Bears: Their Biology and Management. 7: 359-362. Thier, T. 1990. Population characteristics and the effects of hunting on black bears in a portion of northwestern Montana. M.S. thesis, University of Montana, Missoula. 104 pp. Thier, T. 1991. Summary of questionaire given to spring black bear hunters in northwestern Montana. In K. Aune, comp., Proc. Mont. Chapt., The WildI. Soc., Bozeman. Wasem, C. R. 1968. Movement and management of marked black bears in Glacier National Park. UnpubI. Rep., USDI National Park Service, Glacier National Park. 12 pp. Western Technology and Eng., Inc., Helena, MT., 1996, Terrestrial Wildlife Reconnaissance: Stillwater Mining Company Hertzler Tailings Facility and Tailings Line, 1996. October 1996. In Stillwater Mining Co. Mine Waste Management Plan Amendment to Permit #00118 Supplemental Baseline Reports: Terrestrial Wildlife, Vegetation, Soils, Land Application Disposal, Waters of the U.S. January 1997. Web Search Engines for Articles on "Black Bear"